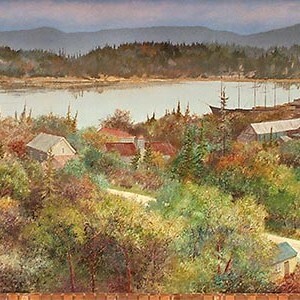 In a panoramic view of Chemainus Harbour, this mural captures the colourful memories of the old logging community. Lumber is stacked up along the far hill, waiting to be loaded onto the tall ships and steamers at anchor in the harbour. Chemainus Hospital appears on the left. At the time, Chemainus was a stable community, far past its pioneering stage. The telephone had arrived in 1908. Four churches served the spiritual needs of residents and Chemainus boasted the best baseball team in the region, the ‘Sawdust Shifters’. It was a time of quiet progress after the boom years of mining exploration in the valley.